Home » CopyKat Recipes » Toll House Pie – who can resist this one? The Toll House Pie is an irresistible pie. Do you love chocolate chip cookies? You are going to love this pie. 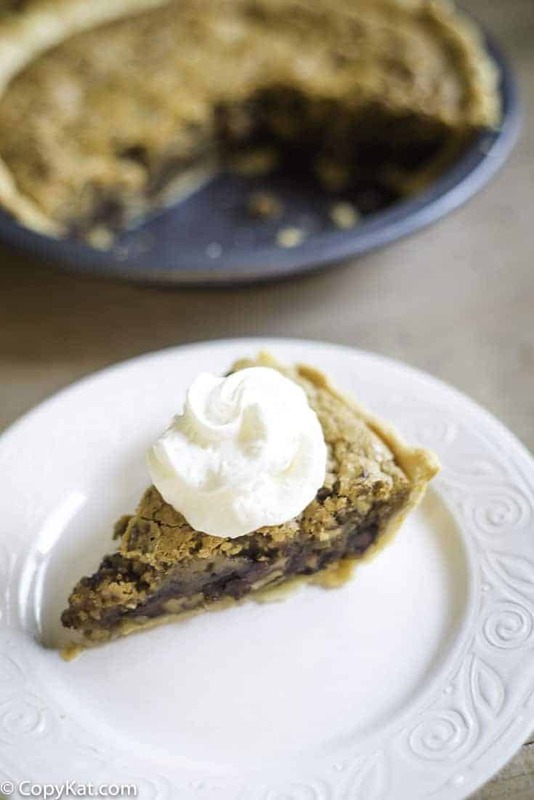 If you love chocolate chip cookies, you are going to love this old-fashioned Toll House Pie. 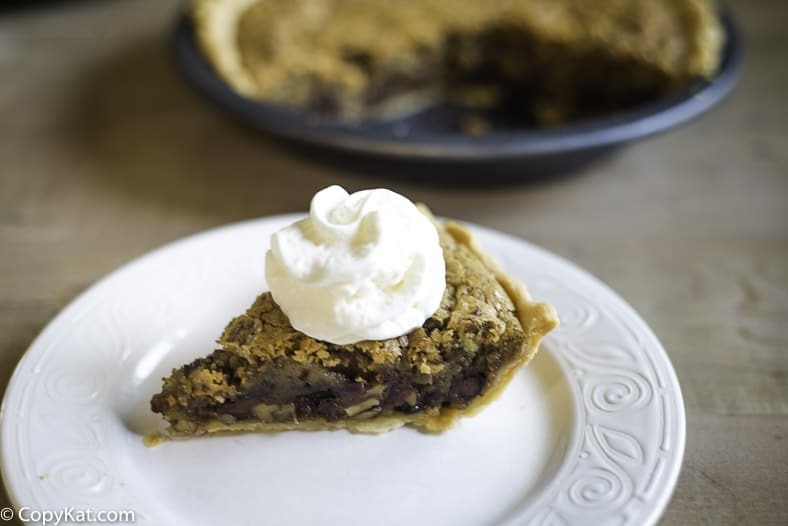 The Toll House Pie is like a warm chocolate chip cookie baked into a pie shell. If that doesn’t sound good, honestly, I don’t know what does. We have Ruth Wakefield to thank for the chocolate chip cookie. She began making the chocolate chip cookies in the 1930s. Ruth baked a variety of confections for you guessed it, the Toll House Inn. A happy accident created the chocolate chip cookie, she wanted to bake unsweetened chocolate into cookies, but she only had semisweet chocolate. So she chipped up chocolate and baked it into those cookies. So it is her, that we owe our thanks. 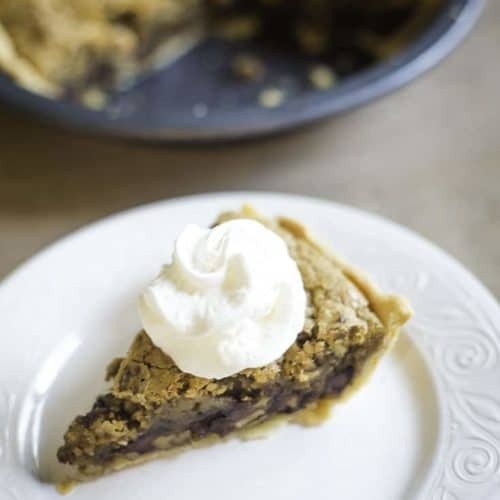 The Toll House Pie is a variation on the cookie, we are going to make a chocolate chip cookie batter that has more butter than a cookie recipe, and pour it into a pie shell. When you cut into this pie and it is still warm, the chocolate chips are warm and nice an melty. Are you a chocolate lover? Be sure to check out some of these chocolate pie recipes. You don’t want to miss out on this delicious pie. You could top it with whipped cream or even ice cream, it’s completely up to you. Love chocolate chip cookies? You are going to love this Toll House pie. In a large bowl, beat eggs until foamy; beat in flour, sugar, and brown sugar until well blended. Blend in melted butter, Stir in chocolate chips and nuts. Pour into an uncooked pie shell. Bake at 325 degrees for 1 hour. May serve warm and top with whipped cream or ice cream. Consider swapping out the chocolate chips for butterscotch chips for variety! I love this pie I have had it many times at a friends house but never got the recipe! This has now been added to my recipe file!